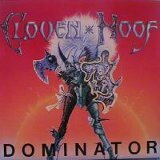 It's surprising how fast Cloven Hoof faded out of the consciousness of metalheads given the strength of some of their 80s releases, but they somehow did. While A Sultan's Ransom is widely considered their best work, I find myself gravitating more towards their 1988 release, Dominator. Despite a crummy production job (exacerbated by studio delays at the time that let an 80s role playing game magazine beat them to the artwork) and an inconsistent shot at a theme for the album, this one is still a treasure and quite listenable. Rising Up immediately showcases the noisy guitar work of Andy Wood, an underappreciated rhythm guitarist, partially due to the aforementioned production job. His riffs blast aggressively at the listener, but still have surprising delicacy on the pinch-harmonic-filled edges, where he performs slight bends to make the tone sweeter. Vocalist Russ North sings cleanly but deeply, in a very accessible way that still allows for plenty of screams. His vocals do the best on my favorite two tracks on the album: Nova Battlestar, a choppy tune with a mindlessly fist-pumping, bass-heavy chorus to which I find it hard to resist headbanging; and Reach for the Sky, the most melodic and consistent track on the album, with a winding, pounding set of speed metal riffs. All the songs (including Warrior of the Wasteland, which starts soft) are as heavy as the band can contrive; there's a feeling that they're trying to put a softer song on here and there, in accordance with 80s album track list formula, but they never quite bring themselves to do it. Perhaps the album topics weren't as hokey in the 80s as now (though one strongly doubts that), but listened to in the present time, there is something appealing about the relentlessly upbeat heaviness, the poofy-haired warrior princess on the front of the album, and the incoherent references to galactic battles and space invaders in the lyrics -- all that is dated on this album is what modern bands would get painted (and ignored) as "retro" for doing, but of course Cloven Hoof comes by it honestly. There is little originality in most of the tracks; The Invaders, a swinging tune with a high-screamed chorus, and Fugitive, which has a fast-driving, palm-muted chorus that shows off Wood's riffing very well, owe a great deal to earlier NWOBHM acts (The Prisoner, anyone? ), but the result is more charming than otherwise, and the enthusiastic delivery on the choruses rarely falls flat. The prime example of this combination of brilliance mixed with a DIY incoherence is Road of Eagles, which was taken from the band's 1982 demo and then spruced up a bit to change the lyrics from the original medieval setting to something more sci-fi; the song sounds like a couple of different songs stuck together, but even this chimera is fabulous when taken in all its parts. Despite all the messiness of Dominator, this gem deserves way more attention than it gets. The guitar in itself is exquisite and North's vocals are perfect for the style and tone of this album, and a couple of the tracks ought to have qualified as better-known hits in my opinion. After almost thirty years, Dominator continues to feel like a well-kept secret.